I rarely do nail art tutorials because it's just a hobby I enjoy and I am by no means a nail technician but when I post my photos on Instagram people always request the 'how to' so here's my latest creation followed by a step-by-step guide on how to recreate it! Start with your base coat. Cut out the hearts that you will place on the accent nails of your choice. Doing this after painting the base coat gives adequate time to dry before applying the heart cut outs. Apply the hearts to all nails you wish to be accented. Quickly paint two coats over the taped hearts. By the time you finish the last nail (I did 4 total between both hands), it will be time to carefully remove the heart on the first nail painted. Use the tweezer and carefully remove the tape. Don't worry if you make a little mistake, you can usually correct it later with the dots or immediately with your dotting tool. While that dries paint all of your other nails. Take your dotting tool into your first color and outline the heart. I left spaces in between each white dot so I could go back with silver in between. On all other nails I used the dotting tool to put one silver dot center in the base of each nail to bring the look together. Take it from me and allow the silver adequate time to dry before applying a generous layer of your quick dry top coat. That's it! You should have a lovely design to enjoy for at least 7 days. So as you can see my nail polish collection has gotten a little out of hand and my excuse is that by NOT having proper storage to house all my little darlings, I end up purchasing the same or similar colors all the time. My mission was to find a pretty way to store them so I could access them easily and see what shades I had too much or not enough of (if I'm honest, even the shades I don't like I have too many). Plus I had this huge blank space in my new bathroom that was just perfect for my vision. After hours searching on etsy.com I finally came across the vendor I wanted to order from however I didn't see any unit capable of holding 200+ polishes. I reached out to Dan & Cara at Fox Claws about possibly custom making a system for me. To my surprise I was replied to almost immediately with a hopeful answer. Long story short Dan built a mock up for me to approve and once I gave the ok, the work began! It's been a month since I placed my order and when the shelves arrived today I knew what tonight's project was going to be. Each was carefully wrapped with painted screws included so all I needed was a pencil, level and a screw driver. I measured 17cm in between but if you hang something like this I would suggest 14cm instead. All the shelves took me less than 5 min to hang but nearly an hour to organize. Fox Claws promised the shelves would hold 200 polishes and I nearly panicked when I counted a total of 266. Luckily they all fit but there is not one space for a new shade unless I get rid of a few to make room - weep. I absolutely LOVE how it turned out and I would highly recommend Fox Claws because of their fantastic customer service and impeccable craftsmanship. There isn't another vendor on Etsy offering this quality at a reasonable price and let's be real... In the long run spending $100 to store my polishes efficiently will likely prevent me from future overspending on shades that I don't need! I consider it a act of frugalness on my part frankly. 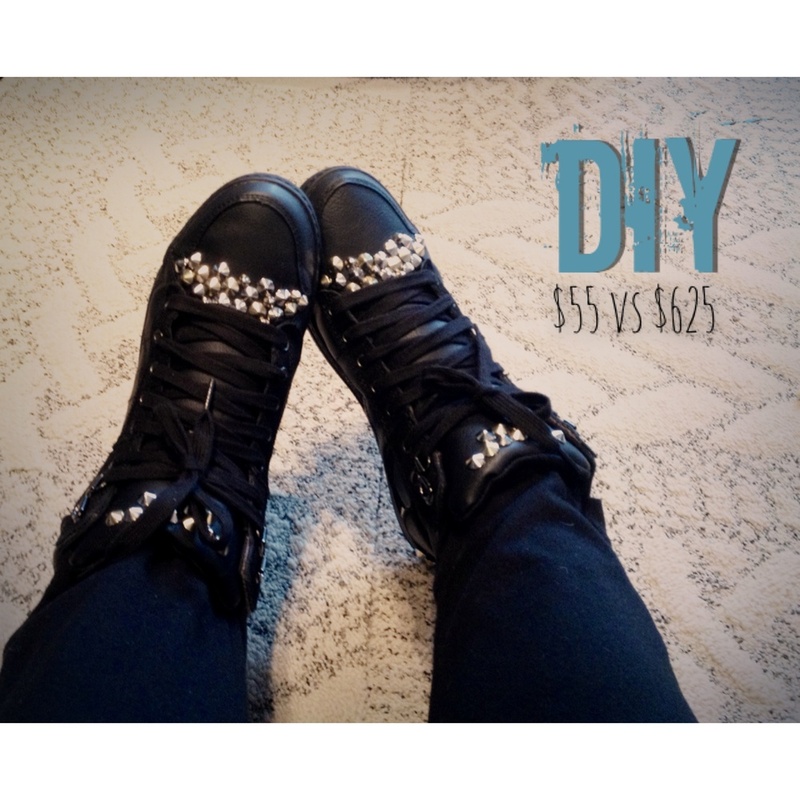 Decide where you would like to place the studs and if you want them in a pattern. I chose a random design and alternated between the silver and brass colors. I used a black Sharpie to color the red Sketchers label making it less noticeable once I glued the studs on which fully concealed it. You may not have to do that step if your trainers don't have any visible labels. STEP 1 Add a tiny dollop of glue to the back of the stud and place it in the center of wherever you choose to start. I suggest starting in the center because you don't want to have gaps in visible areas and its easier to conceal on the sides. You'll want to hold each stud for a moment before moving on to the next. If you are gluing to leather it takes longer for it to stick and if you move on too quickly you'll notice the studs sliding which will create visible glue marks and a mess. Also you might find it helpful to use the knife to apply the glue... I ended up applying the glue directly on the back of the studs instead. STEP 2 Do the same section on the other shoe to allow the first area to partially dry before returning to the first shoe. This will prevent even more studs slipping when you go onto the next section. I didn't do this step for the purpose of photographing the before and afters for you but I strongly recommend it as it will prevent having visible glue marks from the studs slipping. STEP 3 Go back and add smaller studs in gaps if you would like. I happened to have 25 smaller studs on hand that I ended up using to do this (see photo below to compare sizes). Let the glue cure for 36-72 hours before wearing. That's it!